Click image to contact me or buy solarsue.com through my registrar. Anyone interested in being green, saving electricity, using solar panels, selling solar systems, solar power, conserving energy, etc. could easily create their own solar energy blog or website about solar energy using solarsue.com. If you want a site to be about the cutting edge of solar power then SolarSue.com could be the vehicle for getting the word out about your particular interest in solar energy. 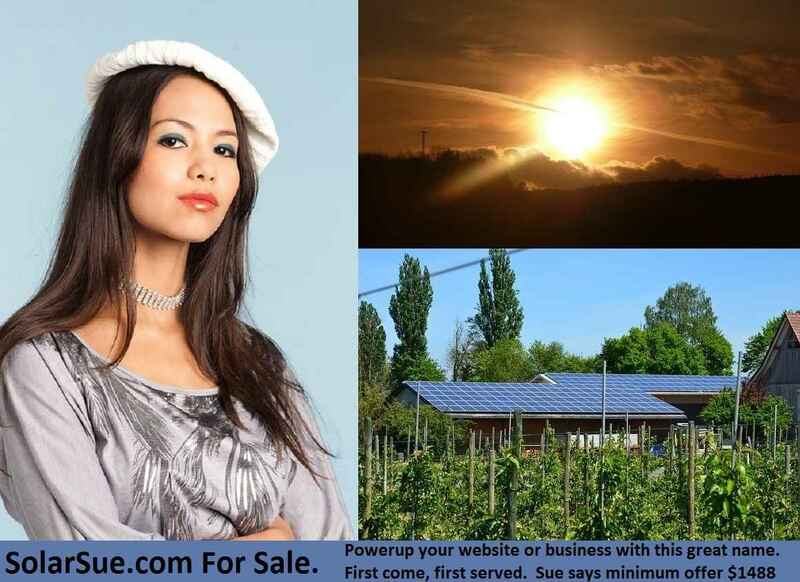 It is very difficult to find a short, relevant .com domain name in the solar energy niche, but SolarSue.com is a really good one for the right business or person. If you don’t want to do it yourself you could always have me create a site for you. For a limited time I will buy for you a niche site course with your domain purchase from me directly or through my registrar, Fabulous.com. It will walk you through step-by-step in creating a very profitable niche blog. What’s a blog? Here are three of mine. Travel Quiz Weekly, Bestow Good Luck, and a new blog I’m starting, Yolky. Domain name purchase must be $1800 or more. Another, better alternative is to PARTNER WITH ME on this valuable domain name. I only want a WORKING PARTNER. Someone who knows how to make money with a website OR preferably someone willing to be trained how to build a website that generates big money. I have the online classes that will train you. Contact me if interested. Only one partner for this potential SolarSue website. Goal $3000/mo. minimum for you. Click here and read about making money with websites. Contact me if interested in SolarSue.com or make an offer.